It's okay, I'm not going to do 'the singing thing' today, I promise! But as I still had a huge bundle of parsley in the fridge and I wanted to experiment a bit with the premise of chimichurri sauce, I decided to have a little experiment for today's lunch. Chimichurri is just like pesto without the cheese and nuts. Or a green herb sauce if you will. Salsa verde. Back to that theme that actually, there are only so many recipes in the world and the rest are just variations on a theme. So starting out with half a huge bunch of parsley, about finely chopped shallot and two fat cloves of garlic, I added 3 tbsp of Waitrose chilli olive oil, a squeeze of lemon juice, some Maldon salt and a finely diced tomato (you need a decently flavoured one here - none of your tasteless supermarket salad toms thank you very much). The chilli oil gives a more even heat to the sauce than chilli flakes would which is a good idea if you're not going to blend. I found the flakes a bit spiky last night. But then again, sometimes a burst of flavour can be preferable to each mouthful being the same. Your choice. Next for the tostadas. I've been meaning to make these forever since I first laid my hands on my copy of Thomasina Miers' Mexican Food Made Simple. But 11 months have passed and despite trying a new recipe every day, I've still almost failed to get round to it. Even in my adult life, I am metaphorically doing my homework on the bus on the way to school*. Making round ones is a little bit wasteful but they look good on the plate if you have guests and I believe that the traditional shape is round. I'm sure real South Americans/Mexicans make them from scratch and so can make them small and round straight away. I chose the lazy way and started with a big shop-bought flour tortilla and cut circles with a pastry cutter. In my humble opinion it would be a waste to go to the effort of making lovely soft tortillas and then toast them. Tried this once, not again. Miers deep fries her tostadas. I wish I could do that and still be as slim as she is! So I adopted my favourite alternative to fried bread-based things. A squirt of olive Fry-Light and into the oven on 200c (fan) until they go brown and crispy. A word of warning to dog owners. Always replace the caps on spray bottles left in the kitchen. I very nearly had tostadas flavoured with the stuff we use to stop the dogs biting the woodwork as the bottles look the same when you're as blind as a bat and someone (naming no names) has left both of them next to the cooker with the lids off. 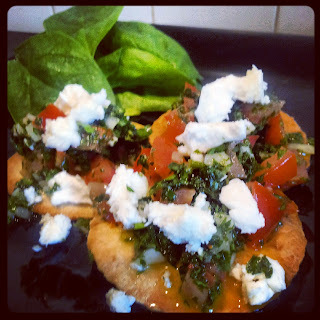 Once the tostadas were baked, I topped each one with a spoon of the chimichurri, sprinkled on some feta (closest you'll get to Queso Fresco in deepest Wiltshire) and hey presto. Lunch. *I was actually a girly swot at school and always did my homework after tea the night I got it. How things change.